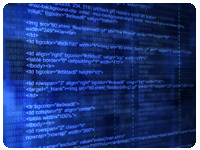 (leading to ExpertRating Perl Programming Skills Certification). This course includes a knowledgeable and caring instructor who will guide you through your lessons, facilitate discussions, and answer your questions. The instructor for this course will be Nathan Meyers. About the ExpertRating Online Perl Programming Course instructor : In over 20 years as a software developer, Nathan Meyers has used Perl extensively for PC and server applications. He has instructed courses in the corporate environment, on introductory Unix and on using programmable financial calculators. He is also the author of the Macmillan book "Java Programming on Linux", numerous conference papers, and articles in trade publications. Introduction to Perl Programming Skills Course requirements: For taking this instructor led ExpertRating Online Perl Programming Course you need Internet access, e-mail, and the Microsoft Internet Explorer or Mozilla Firefox Web browser. In addition, you'll need access to a computer on which you can run the course software - the Perl interpreter and the Apache Web Server. The course supplies all necessary software for Windows. The software is also available (for free) for many other systems, including Mac OS X and Linux, although you'll need to download, install, and configure it yourself if you are running on one of those systems. "Although work often takes away from concentrating more on the lessons, the course presented me with immediately useful information. I intend to keep these lessons as reference material when I continue with Perl programming." "I enjoyed this course especially the writing style of the teacher. His style showed a sense of humor and made the class fun. I could see how it would be a great experience to be in his on-campus class if it was possible. I appreciated his quick response to the questions I posted." "Instructor was great. I'd love to take another of his classes." "It was a real honor to be your student this past month. I can't begin to describe how eager I am to begin writing Perl codes of my own! Your web pages have been easy to comprehend, full of powerful information, and just plain fun! I'm very glad to have had you as my instructor in learning Perl, and wouldn't have wanted anyone else. Thanks again for a wonderful course!" "I've programmed computers for 40+ years in every language known to mankind (OK, almost every language ...) and was self-taught in Perl in order to do my job. This course was FANTASTIC in opening my eyes to new ways to do things, tricks and hints and in explaining things I just took on faith before enrolling here. The instructor's lessons are great…clear, concise, easily readable. The quizzes and exams were not 'gimme' types, but, instead, made you think….I'm excited about the new knowledge I've added to my almost-full brain and looking forward to utilizing Perl more and more as time goes on. GREAT COURSE! GREAT INSTRUCTOR! FANTASTICALLY GREAT EXPERIENCE!!!" "Overall, the course provided a good introduction to the topic and I would like to learn more." "This is a really well organized class. I felt that the pacing was excellent. I liked the examples and thought they demonstrated the points well. The assignments were interesting and could be extended by the student if they wanted to go further." "This is my first on-line/distance learning experience and I must say I'd do it again. It was very convenient to be able to catch up with the rest of the class even after being weeks behind. The instructor did a superb job at organizing the material, selecting the examples, and following up on the questions posted in the discussion areas. Great job, Nathan! Thanks from a very satisfied customer." "This is my first programming course in class or online in any programming language. Nevertheless, I feel that this course was presented at the right level and detail. The quizzes and assignments were often pretty challenging, but within reason and appropriate. Excellent job - amazing what you can teach online!" "This was my first experience with an online course, and after this positive experience I feel extremely motivated to take others. The instructor did a fantastic job with this course. The lessons were to-the-point without being too wordy and without being so strictly factual as to give the feeling of swallowing a handful of dry milk powder! I also liked the way the discussion questions were handled. The instructor came across as being helpful and supportive without making folks feel like dummies. I've taken countless classroom courses from many differenet instructors (while obtaining my Masters and PhD) and even taught a few classes myself (so I know it's not so easy to be a successful teacher). I have to rate this class as one of the best -- an excellent course by an excellent instructor, You are lucky to have Prof Meyers!!" ExpertRating is one of the world's only ISO 9001:2015 Certified companies (from TUV America) offering an Online Perl Programming Course (leading to ExpertRating Perl Programming Skills Certification). When you choose the ExpertRating Online Perl Programming Course you can be sure that you are buying a premium International certification that is recognized by hundreds of employers and Government bodies in the US and other countries. With ExpertRating you get certified quickly online and you are equipped with a store house of information through the in-depth ExpertRating Online Perl Programming Courseware which has been developed by experienced Perl Programming Experts. The ExpertRating Perl Programming Skills Certification is by far the best value for money instructor led Perl Programming Program at $129.99. How much does the Perl Programming Skills Certification cost and what does it include? You can buy this ExpertRating Online Perl Programming Course leading to Perl Programming Skills certification at a special offer price of only $129.99 which includes the in-depth ExpertRating Online Perl Programming Courseware and exam fee. This is the best value for money Perl Programming Program available till date. You get the following services within the USD $129.99 fee. In-depth ExpertRating Online Perl Programming Courseware including scenarios and case studies. World wide airmail delivery of the hard copy Perl Programming Skills Certificate. 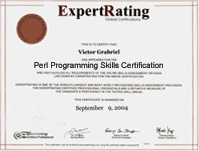 The Perl Programming Skills Certificate can be used to prove your certified status and does not mention the words "online". The process of getting yourself certified is very simple. All you have to do is buy the ExpertRating Online Perl Programming Course for $129.99. Log in to the instructor led course using your password. Go through the ExpertRating Online Perl Programming Courseware (which would take you 6 weeks) and complete the final Perl Programming Skills Certification exam at your convenience. You can complete the exam within 2 months of buying the Perl Programming Skills Certification. The result of the exam appears as soon as it is completed, and your Perl Programming Skills Certificate is mailed immediately. Chapter assignments to help you practically use the Perl Programming Skills that you will learn during the Perl Programming Course. The final exam is fully based upon the ExpertRating Online Perl Programming Courseware that is provided along with the Perl Programming Skills Certification. If you have gone through the courseware properly you should not have a problem clearing the exam. The exam consists of multiple choice questions from all chapters of the ExpertRating Online Perl Programming Courseware. The new and improved version of Perl, that is, version 5.6 of Perl, contains features like threading, the compiler, Unicode and many other features. Perl is a programming language which is used for extracting information from a text file, printing out a report and converting a text file into some other form. Perl shares the characteristics of other programming languages like C, shell scripting (sh), AWK and Lisp. Besides the above mentioned functions, Perl is also used for graphics programming, system administration, and network programming. Perl is the best application for tasks that involve database access, graphical programming, system utilities and software tools. Modules written for Perl allow the programmers to speedily develop programs which integrate complex data types, object-oriented technologies and graphical user interfaces. The ExpertRating Perl Programming Certification will guide you to mission important projects both in private as well as the public sectors. In the first lesson, you'll discover the Perl scripting language and learn how it compares to environments like Java and C++. You will install Perl on your PC, and you'll write your first Perl scripts. This second lesson will introduce many of the building blocks you'll use in all of your Perl scripting. You'll learn how Perl lets you manipulate text and numbers in simple but powerful ways. This lesson will illustrate these capabilities with a simple game written in Perl. This lesson continues the study of Perl's basic building blocks. You'll learn how scripts can make decisions, perform repetitive operations, and do more advanced programming with text and numbers. 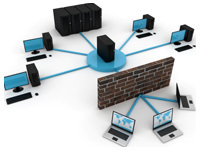 Through class projects, you'll discover how Perl is used to extract and process information. You'll add arrays and lists to your scripting arsenal. These powerful tools will help you solve many more advanced problems than have been covered so far. You’ll revisit some of the earlier projects to see how they can be done more easily with these new capabilities. This lesson introduces debugging: the tools and techniques that you can use to find and fix problems as you develop your own Perl scripts. This lesson will take a close look at files and directories, learning how Perl can read, write, and create files and folders on your computer. This lesson will illustrate by writing helpful utility scripts for managing your own files and folders. This lesson adds two important Perl features to your arsenal: hashes and subroutines. You'll find that many of the projects you've done so far become even easier with these powerful new capabilities. In this lesson, you'll learn all about regular expressions, one of Perl's most important capabilities for advanced processing of text. Through class projects, you'll see how this lets you write useful scripts for processing text from files. In all of your work with Perl so far, you've been writing scripts to run on your own PC. With this lesson, you'll learn how to bring your Perl capabilities to the World Wide Web. You'll find out how to use everything you've learned to write interactive Perl-based Web pages. This lesson will explore how Perl can interact with other programs on your computer. You can use the information to build more powerful scripts and Web pages that take advantage of the capabilities of other programs available on your PC. In the final lesson, you'll learn where you can go to further enhance your knowledge of Perl. This lesson will introduce a few advanced capabilities you can explore further on your own, and will point you toward collections of Perl software and documentation that can teach you more about Perl and help you write more useful scripts.